Sketch time at STAMPlorations, folks! I did a partial stencil print for my background on the panel, then stamped some leaves from Vignette: Retro Mod Shapes, stamped some flower circles from the same set and punched them out with a one-inch circle punch and popped them up on foam dots. I added some card candi from Craftwork Cards. 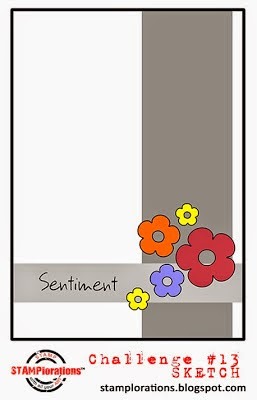 The sentiment is from Sentiment Builders: Happy. The basecard was a rescue: I'd swiped Festive Berries and Seedless Preserves Distress Stains over the card and decided I didn't like it, and it had been waiting around for inspiration. So I sponged Picked Raspberry over it. I'm getting to like pink. Here's the sketch. I stuck pretty close to it this time. Pop over to the STAMPlorations blog to check out what my teamies and our guest designer, Monika from Stamping with a Vengeance, have created, and join in the fun :) As always, there are prizes on offer for our sketch challenges - and if you enter both sketch challenges for June and the monthly challenge (starts Friday) you'll be in with a chance of winning these fabulous Tim Holtz stencils! Just Add Ink: Just Add Watercolour (Tim's watercolour stencil technique for me). Beautiful card, such vibrant colours. I love the technique you used for the watercolour stencil it is so effective. WOW...WOW....WOW!!! This is by far my absolute favorite of all the amazing cards that you have created! The card base rocks! Loving the pink, great card, really zingy and fresh, fab! The colours are so fresh and funky! Ms Shirley - did you see the new Tim Challenge - its all watercoloury gorgeousness - I totally though of you and your gorgeous watercoloury style when I saw it - I bet you are going to come up with something mind-blowingly beautiful. Thanks for liking my "pipes"! WOW! 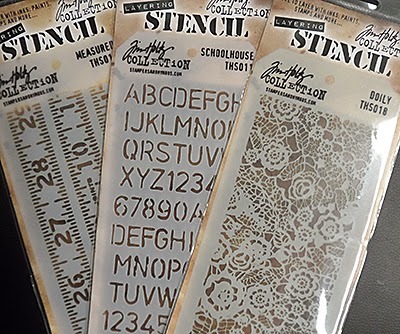 AWESOME job with the sketch -- I love the subtle stamping with the dots!! Goodness, this is such a delicious card!! I am loving that pink background and the artsy watercolored stamped panel! It goes so well with the retro blooms! Wow - this card really bursts with color! Fabulous! Shirley, this is FABULOUS! You did more than rescue that card base - it's a stand-out feature. Love, love, love the bright happy colours. Thanks for entering your lovely card in our challenge at Just Add Ink. Wowzers such a bright, vibrant, sunny and cheerful card, can't help but smile. This is simply gorgeous...I adore the hot pink and yellow combo! I love that background and the bright colour combo - cool card, Shirley! Oh what a fabulous card, love the vibrant colours, it really pops on the white. Oh I just love those splotchy stripes Shirley, they such great bright colour and texture. Thanks for joining us at Just Add Ink. What a beautiful and bright card you've created! I love the colours you've chosen for the watercoloured background.